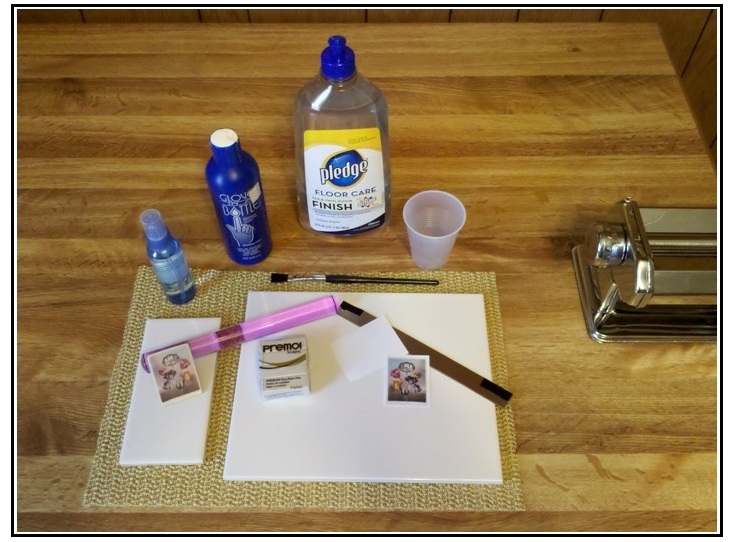 Polymer clay image transfer is a technique for taking pictures printed on a laser printer or photocopier and fusing that image to the surface of clay. Whether you're transferring a delicate floral pattern or your favorite cartoon character, this is an exciting, easy method that opens up endless possibilities for making jewelry and other decorative crafts. Obviously before you begin you must find and print an image that you wish to transfer. When working with computer graphics, try to choose nice, sharp originals - remember that the final image can be no better than the graphic you begin with. Also be aware that the image will be reversed when it is transferred. If there is writing in the graphic, or you simply want the final to be in the same orientation as the original, then you will want to work with graphics software that enables you to reverse your image before printing. Although there are special transfer media that will work with ink jet printers, the technique described here is based on using toner-based print onto plain paper. Toner is used in all laser printers and virtually all copiers with the exception of some small, home office units. Toner is made from plastic, not ink, and in this method it is the plastic toner itself which is transferred. If you are new to working with polymer clay, you might first read Getting Ready to Work with Polymer Clay for helpful tips. 1. Condition your clay into a nice even and flat piece, equal to the desired thickness of your finished piece. 2. Place your clay directly on your baking tile, to avoid the possibility of distorting the image by moving the clay. Be sure it is lying perfectly flat. It is a good idea to make a gentle pass or two with your roller to release any air that may have become trapped underneath. 3. Using your blade, trim your clay to a workable size. At this point, do not be concerned with the finished size because you will be trimming again after your image is transferred. 4. Lay the image, toner side down, into the position you want. 5. Burnish (rub) the back of the image using something smooth such as a knitting needle, the back of a spoon, or the pad of your finger. It is a good idea to place an additional square of paper between the project and your finger. Your finger will slide over the back of the transfer more smoothly and the paper will protect the surrounding clay. You must use enough pressure to assure good contact between the image and the clay, but not too much pressure as you might distort the clay. Be careful to be thorough in this step to ensure the entire image is transferred. 6. Keeping your original image face down on the clay, spritz the piece using your spray bottle to wet the transfer. The water will soak in rather quickly. 7. Almost immediately, begin rubbing the paper lightly and quickly with your finger. Start from the center and work outward in a circular motion. The idea here is that the wet paper will disintegrate and roll away leaving the transferred image behind. The paper will begin to feel dry as you work. Repeat spraying as necessary to keep the paper soft enough to roll. Work until the piece is smooth and all of the paper is removed. 8. Using your clean sharp blade, trim away any excess clay from the borders of your image. You may notice some stray paper fibers becoming visible as the last traces of sprayed water evaporate. There is no need to worry, as these can be removed during your finishing steps. 9. Bake at the recommended temperature for your clay. 10. Once cool, you can finish your piece by wet-sanding the back surface to remove the shine created by contact with your tile during baking. You may also sand the sides and corners to smooth any hard edges. It is very important that you do not allow sandpaper to touch the image. Although the image has now fused with your clay, it is only surface deep and could accidentally be removed. If you need to remove any leftover paper fibers, they will rub off with your finger using a gentle trickle of cool water from the tap. Once completely dry, your image can be protected by applying a coat of Pledge Floor Finish with Future, which will air-dry and is easily buffed with a soft cloth.